From self-employed workers in a home-based business to large multinational corporations, business enterprises provide crucial goods and services to both consumers and other businesses. Roughly 2.4 million business establishments operated in Canada at the end of 2010. Employer businesses numbered 1.1 million at the end of 2011. Indeterminate businesses (including many self-employed and contract workers) totalled 1.3 million establishments. More than one-half (57.5%) of these businesses were located in Ontario or Quebec. British Columbia and Alberta accounted for another one-third (29.5%) of all Canadian businesses. In 2011, among employer businesses, about 55.4% had 1 to 4 employees and 42.5% had 5 to 99 employees. Another 1.8% had 100 to 499 employees. Businesses with more than 500 workers comprised only 0.3% of the total number of firms. In agriculture, forestry, fishing and hunting, 71.6% of businesses were considered micro—employing 1 to 4 employees. In professional, technical and scientific services, 75.2% were micro. In other services, except public administration, 69% were micro. Small enterprises were also major players in the labour market, employing 30.8% of the workforce in 2010. In 2005, small and medium-sized businesses, including unincorporated businesses, represented 54.3% of GDP produced in the business sector. Large firms with 500 or more employees accounted for 45.7%. Businesses with fewer than 100 employees, including self-employed workers, accounted for 35.8% of Canada's GDP—about $321 billion in 2005. Since there are fewer private sector employment opportunities during economic recessions, the number of self-employed workers tends to increase. From 2008 to 2011, it expanded by 47,300 to 2.7 million people. Self-employed workers include those with incorporated or unincorporated business that may or may not use paid help. 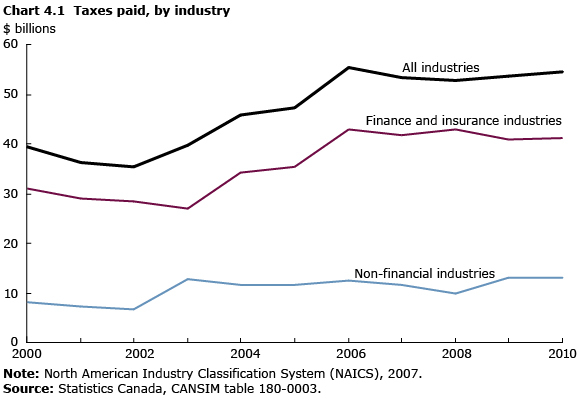 Across all industries, Canadian corporations earned operating profits of $287.9 billion in 2011, up 11.6% over 2010 and 43.1% over 2009. Canada's finance and insurance industries earned $70.2 billion and alone accounted for almost one-quarter of total corporate profits. The oil and gas industry earned $14.9 billion and construction earned $12.0 billion. As profits rise, so do corporate taxes owed to government. Corporate taxes payable rose to $54.4 billion in 2010, from $53.7 billion in 2009. Canadian corpora­tions paid $33.8 billion in federal taxes and paid $20.6 billion in provincial taxes. As for business failures, the number declaring bankruptcy has steadily declined almost every year since 2000. By 2010, business bankruptcies across Canada were at 4,072 cases, a 24.9% drop from 2009 levels. Businesses had $1.9 billion in total assets and $8.6 billion in liabilities at the time they filed for bankruptcy. Survival rates for businesses with fewer than 250 employees decline over time. About 85% of new businesses survive for one year, 70% survive for two years and 51% survive for five years. In 2010, the value of assets, revenues and profits increased for both foreign and Canadian-controlled enterprises. The shares of foreign-controlled revenues and profits increased from 2009, while the share of assets under foreign control were unchanged. Canadian-controlled asset values increased 5.7% in 2010, while foreign-controlled assets rose 5.4%. Foreign-controlled enterprises accounted for 19.7% of assets, unchanged from 2009. Revenues of foreign-controlled enterprises increased 6.4%, compared with a 5.7% increase for those under domestic control. As a result, the share of revenues under foreign control edged up from 28.8% to 28.9%. Operating profits for foreign-controlled enterprises increased 39.3% in 2010, while those under Canadian control rose 21.8%. Consequently, the share of profits under foreign control increased from 20.2% to 22.5%. This was mostly attributable to the non-financial sector. Manufacturing remained the largest sector in terms of non-financial assets. It was also the sector with the biggest share of foreign-controlled assets, at 53.0% in 2010, down from 53.8% in 2009. The value of assets for Canadian-controlled manufacturers rose 3.9%, while those under foreign control increased 0.7%. American-controlled enterprises increased their share of assets to 52.5% in 2010. However, U.S.-controlled shares of foreign revenues and profits dropped to 58.1% and 58.4%, respectively.